Go to original pattern for design DROPS Children 6-9. Cardigan and hat in Karisma. Border: Knit 3 cm stockinette st with purple, change to marine, knit 1 row, purl 1 row, knit 1 row, change to purple and knit 3 cm stockinette st.
Pattern: See chart (1 chart = 1 repeat). The pattern is seen from the right side and is knit entirely in stockinette st. Arrows indicate the starting row for different sizes. 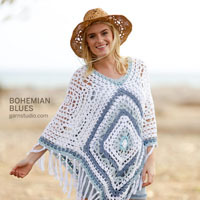 Body: Knit the cardigan in the round on circular needles after the rib and cut steeks for armholes and at the center front afterwards. Cast on 134-144-152 (164-172) sts on smaller circular needles with marine and knit 5 cm rib back and forth on the needle as follows: 1 row marine and then knit the rest with purple. 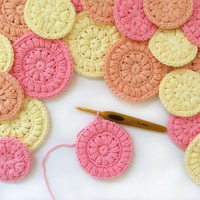 Change to larger circular needles; join and place a marker at the join. Change to stockinette st and increase 22-24-28 (28-32) sts evenly distributed on the 1st row, plus 5 sts at the center front (these sts are for the center front steek and are not knit into the pattern) = 156-168-180 (192-204) sts (+ 5 steek sts). 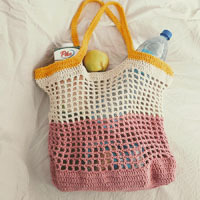 Knit Pattern (refer to chart in Små Drops No. 6 and start at the appropriate arrow). At the same time, when the work measures 21-25-24 (26-30) cm , inc 4 sts on each side (these sts are for the armhole steeks and are not knit into the pattern). When the work measures 35-40-41 (44-49) cm , bind off the center 24-24-26 (26-28) sts (+ 5 steek sts) in the front for the neck and knit the rest back and forth on the needle. Then bind off for the neck every other row: 2 sts 2 times, dec 1 st 2 times. When the work measures 38-43-44 (47-52) cm , bind off the center 34-34-36 (36-38) sts in the back for the neck. Then dec 1 st at each neck edge on the next row. 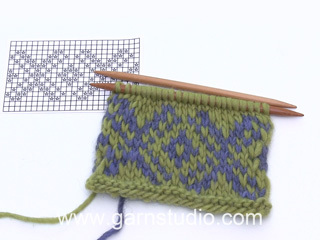 Bind off all sts when the work measures 40-45-46 (49-54) cm (adjust for complete pattern). = 76-80-88 (92-96) sts. When the work measures 26-30-33 (37-40) cm (adjust for pattern) knit 2 cm in reverse stockinette st with marine for a seam allowance over the cut edge on the body. Bind off. Assembly: Sew a marker thread down into the center of the increased sts on each side and at the center of the front. Sew two machine seams around the marker thread, 1st seam = 1/2 st from the marker thread, 2nd seam = 1/2 st from first seam. Cut up for armholes and at the center front. Sew shoulder seams. Pick up approx. 80-100 sts along the left front with purple on smaller circular needles and knit Border back and forth on the needle. Repeat along the right front, but after 1.5 cm make 5-5-6 (6-6) buttonholes evenly distributed on the buttonband - 1 buttonhole = bind off 2 sts and increase 2 new sts on the next row (remember to make the buttonholes on the folding edge). Pick up approx. 80-96 sts around the neck on smaller double pointed needles with purple and knit Border back and forth on the needle from the center of the front. Fold the edges over against the wrong side and sew. 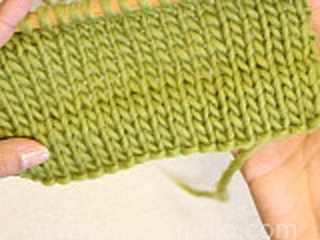 Sew the sleeves to the body from the right side as follows: Sew alternately a st in the last row of knitting on the sleeve before the seam allowance and a st on the body after the machine seam. 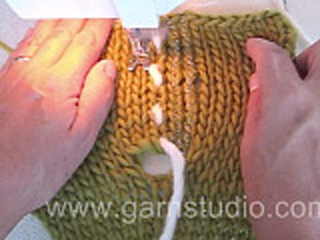 Turn the sweater inside (wrong side) out and sew the seam allowance from the sleeve over the cutting-edge on the body by hand. Sew on buttons. Hat: Cast on 94-100-102 (104-108) sts on smaller double pointed needles with marine and knit 3 cm rib as follows: 1 row marine and then knit the rest with purple. 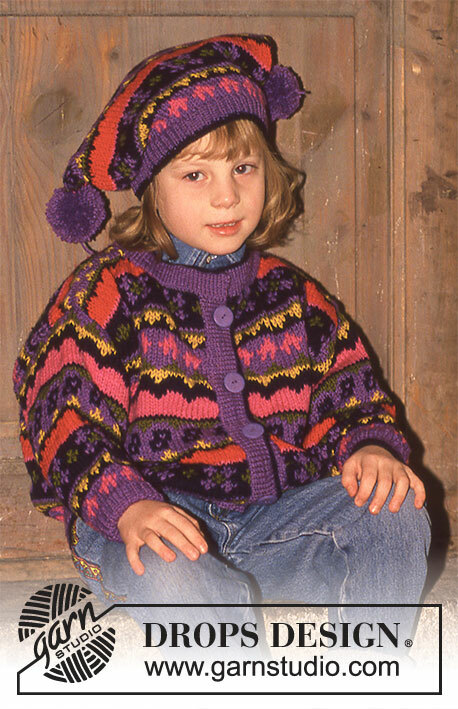 Change to larger double pointed needles and knit Pattern as on the body (refer to chart in Små Drops No. 6). 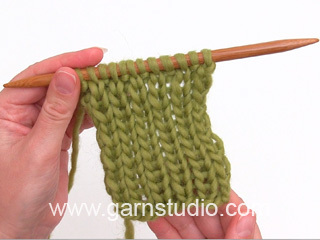 When the work measures 20-23-24 (25-25) cm , bind off (adjust for pattern). Lay the hat flat and sew the top together from side to side. Make 2 tassels in purple and sew one onto each corner (approx. 5 cm in diameter).